Ready to do your taxes while on the go? Elsewhere we discuss online tax programs for the 2011 tax year, but here we'll focus on tax apps optimized for phone and tablets. Apps for creating and e-filing your income taxes on your phone aren't a new concept: A year ago, Intuit introduced SnapTax, an iPhone app designed to handle filing very simple returns (1040EZ only). But developers have seen the handwriting on the wall, and most services are now working to ensure that you can do your taxes on tablets--especially iPads--regardless of how complex your return may be. 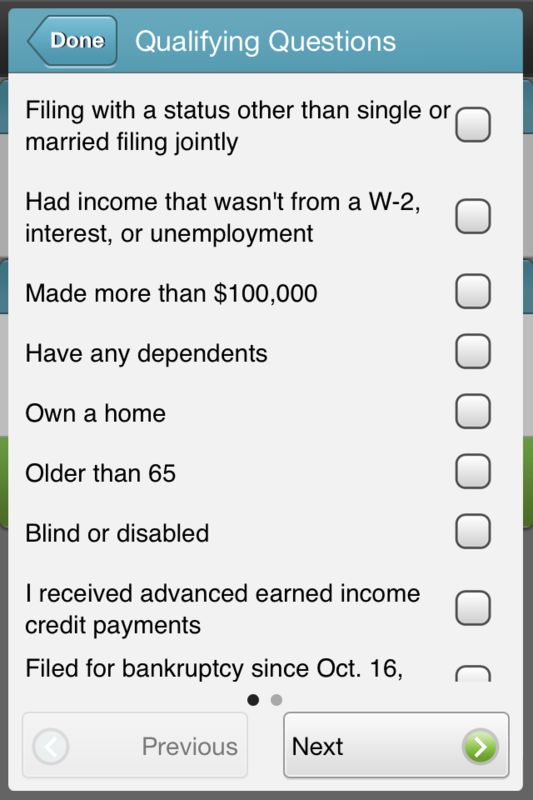 It uses the same design elements as the desktop and Web versions of TurboTax, but TurboTax for IPad has such iOS-specific features as the left navigation bar shown here. The most useful offering is Intuit's TurboTax for the iPad, a snazzy-looking version of the same software you'd get on the Web, with the same data import capabilities and unlimited access to tax experts. Like TurboTax Online, the iPad version is free to try; you pay only when you print or file, at which point the price is based on the features you use. The original download is the Deluxe version of TurboTax, but you can opt instead to unlock the Premier edition or the Home and Business edition (and pay the same price you would for the equivalent Web service). As with the Web services, you pay for each return (with desktop software, you pay only e-filing fees for additional returns). But because the iPad edition of TurboTax resides on your tablet, you can work on your taxes even when your iPad isn't online. 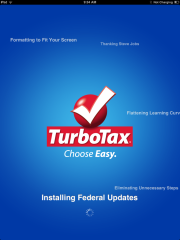 During initialization, after you launch TurboTax for iPad, you'll see a snazzy looking blue screen with background phrases swooping by. I've seen complaints in the iTunes App Store from users who started their return online and didn't understand why they couldn't complete it using the iPad app. Though the criticism is accurate, Intuit has eliminated Flash from its Web services, so you can use Apple's Safari Web browser to complete your TurboTax Online return on your iPad. I also saw some iTunes App Store complaints from users who couldn't import a previous year's return. In my hands-on tests, however, I had no trouble importing my TurboTax Online return for 2010. Importing a return created using TurboTax desktop software is more complicated, however: You have to sync it via iTunes, and some users have complained of password issues. I wasn't able to test this feature. 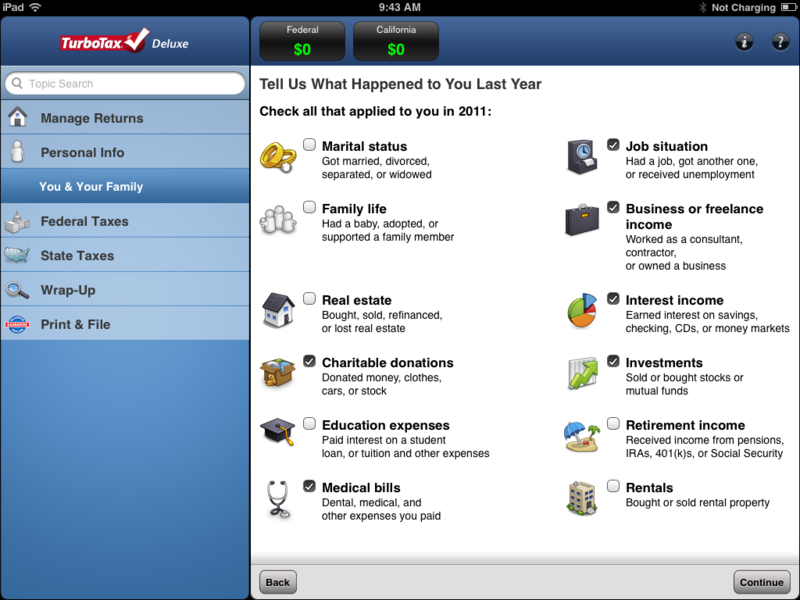 Intuit has seveloped several other tax-related apps. 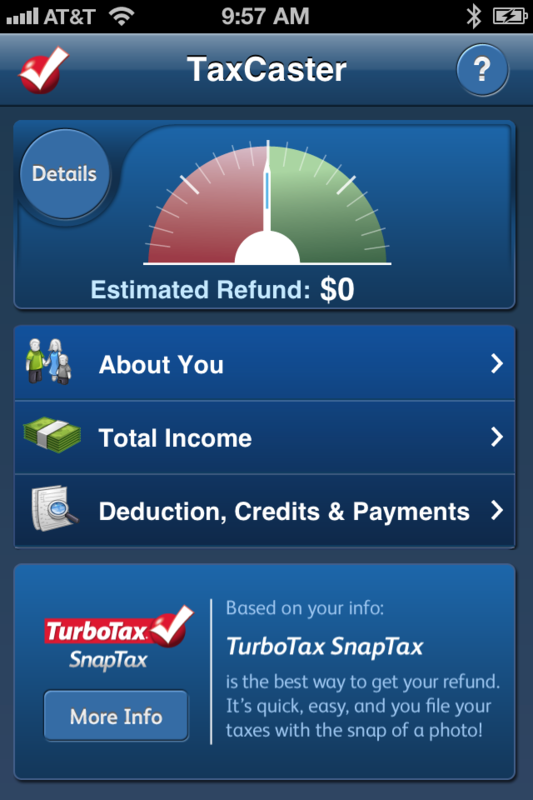 SnapTax is back for the iPhone, and this year Intuit offers it for Android devices (2.1 or later), too. However, you can use SnapTax only if you fit a narrow profile: You must file using the 1040EZ form; you must not own a home or have kids; your reportable income must consist exclusively of wage, interest, and/or unemployment benefits; and your earnings must total less than $100,000 if you're single, or $120,000 if you're married filing jointly. One interesting SnapTax feature lets you attach a copy of your W-2 (which you create by photographing the actual form) to your return electronically. The app also uses optical character recognition software to grab the W-2 data and put it into your return (you should check the accuracy of the transferred data carefully, though). As with the iPad app, you can download and try SnapTax for free, paying only when you file. Intuit's site says that the price for federal and state filing via SnapTax is $20, but it guarantees that price only through March 24). TurboTax's free TaxCaster uses your answers to a few routine questions to create a ballpark estimate of your tax bill (or refund). A couple of other Intuit apps provide free tools (for iPhone and Android 2.1 or later) to help you with your taxes. MyTaxRefund by TurboTax promises to keep e-filers (whether they used TurboTax or not) posted on when they'll receive their tax refund, assuming that they have one coming. TaxCaster generates what Intuit calls a "ballpark estimate" of your tax obligation based on data you enter (it also recommends the TurboTax edition that Intuit thinks you should use based on that data). H&R Block has no direct competitor to the full-featured TurboTax iPad app. But Block clearly has big plans for mobile products: It has created an entire division--H&R Block Mobile--with its own website. This year's offerings include an iPad app with the features of H&R Block at Home Free Edition. Though the Free Edition for iPad doesn't limit you to a 1040EZ filing, Block says that it's suitable only for people with "simple" returns, which Block defines as excluding income from self-employment, rentals, royalties, farm, or shareholder/partnerships. Like the Block at Home Free Edition, Block's iPad app is free--and e-filing a federal return is free, too. If you want to create and e-file a companion state return, however, you have to pay $30. People with simple tax situations can create and file returns using H&R Block Mobile 1040EZ for Smartphones, a rival to Intuit's SnapTax. Block's free SnapTax rival, H&R Block Mobile 1040EZ for Smartphones, comes with the same restrictions as SnapTax (no homeowners; no dependents; only wage, interest, and/or unemployment income; less than $100,000 if single or $120,000 if married). And like SnapTax, H&R Block Mobile 1040EZ for Smartphones will use a photo of your W-2 to capture its data and send to the IRS. Even better, at this writing Block isn't charging anything for e-filing federal and state returns from 1040EZ for Smartphones. On the other hand, I can find only the iPhone version of the app as yet, though Block's site promises an Android version. Block also offers the free, generically titled H&R Block Mobile App (for both iOS and Android 2.1 or later), whose modest features include a tax estimator, a Block office locator, an appointment scheduler, a glossary of tax terms, and a database of general tax information. TaxAct, too, has developed a free tax utility for the iPhone and for Android (2.1 or later) devices. Among the features of TaxAct Central are a refund status checker, tax tips from expert J. K. Lasser, a tax calendar, and a checklist to help you assemble tax documents. TaxAct says that its Web-based software is compatible with the Safari browser on iOS devices. 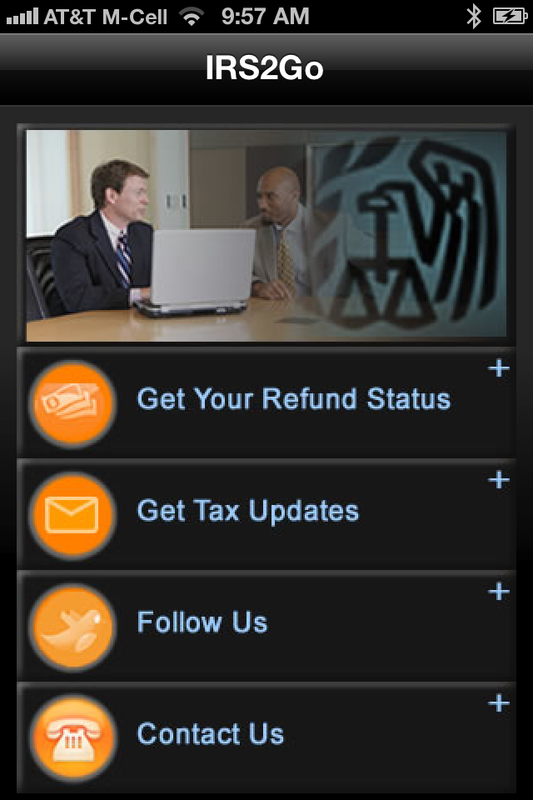 Even the IRS now has a smartphone app that enables you to track a refund, get tax updates, and keep up with IRS news. The IRS itself introduced a mobile app (for iOS and for Android 2.0.1 or later) last year. IRS2Go lets you check the status of a tax refund, sign up for tax tips, and monitor IRS Twitter feeds. The agency has updated the app for 2011 returns. A search of the iTunes App Store and Android Market using the keyword "tax" brings up a smattering of other income tax utilities, but none of these seem more useful than the brand-name offerings (and you have to pay for some of them). It will be interesting to see whether those results change in the next couple of years.